Jenny has been involved in every aspect of the performing arts since the age of 3 and possess 15+ years of professional business experience. She graduated with a double major in theater arts and dance from the University of Minnesota- Twin Cities. While in college she began teaching dance and drama at various performing arts schools in Minneapolis and began working professionally in both areas. Upon moving to Chicago she continued to fulfill her passion for teaching and became the head choreographer for the Actor’s Equity- Northbrook Children’s theater and later accepted a position as Artistic Director with Soul2Sole Dance Inc where she has been for the last 17 years. The owners of Soul2Sole Dance Inc had so much confidence in her ability that they turned over virtually every aspect of the business to her including Program Development, Human Relations, Event Management, Mentorship, and Community Outreach. Jenny and her Husband have been married for over 20 years and live in Huntley along with their 14 year old son- Jett- and their 2 dogs- Sunny and Holly. She is excited to bring all of her experience and passion to GiGi's Playhouse! Hurain is originally from St. Louis, and she lived in Boston while earning her Master's degree in Public Health. She also holds a certification in Health Education. Hurain has worked for the Boston Public Health Commission, the Girl Scouts of Eastern Missouri, and Next Wave STEM to provide influential technological interventions to grade schools in Chicago. She is passionate about working with communities, developing wellness programs, and working with individuals with Down syndrome. Hurain has a 15-year-old brother named Amad who has Down syndrome. He loves to swim, play basketball, and tell knock-knock jokes. In her spare time, Hurain enjoys traveling, exercising, shopping, organizing, and spending time with friends and family. I have been married for 27 years and have 5 great children. 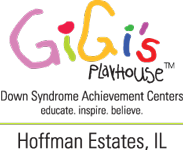 My youngest daughter Annabelle was born with Down syndrome which lead me to GiGi’s Playhouse. I walked into the playhouse in January 2006. My daughter Annabelle was 6 weeks old. I was looking for a place to celebrate my daughter, I did not need or want a support group, I wanted a celebration. I jumped in right away and was volunteering and helping with special events. Once Annabelle went to preschool I went back to school for my Master of Social Work. During that time, I was invited to do my internship with GiGI U. They just finished their pilot stage and were ready to welcome their first class. I fell in love and have been working with the career development program and have worked in all three parts. I was the GiGi U program coordinator, store manager and now career development manager. I have spent some time working with other mental health agencies, but I have to say that I am in love with our adults. Michael graduated from Loyola University Chicago with a degree in Sport Management. He worked as a Programs manager for a sports facility and helped facilitate summer camps and an afterschool care program at this location. Michael is currently assisting at the Northern Illinois Special Recreation Association with sports programs as well as coaching a Special Olympics Bocce Ball Team. In his free time, Michael likes to take his dog for walks, spend time with family and friends, and watch the Chicago Bulls and Chicago Cubs. Karen Russell Owens has worked in Special Education for over 20 years. She has volunteered for many organizations such as Turning Point, IOLS, Refuge for Woman, and Willow Creek. She volunteered for GiGi’s Playhouse for 6 years in McHenry and was their co-chair for their Spring Fashion Show for two years. GiGi’s Playhouse captured her heart from the start. Karen lives in Huntley with her husband Troy. She has 3 children Tyler, Nicholas, Emilee and two step daughters Callie and Chloe. She is excited to bring her passion and energy to GiGi’s. Nancy Binger is the National Program Director serving the National Office and the Hoffman Estates playhouse. She previously spent 17 years working at Judson University in Elgin, Illinois. Nancy held many leadership roles during her career at Judson including Director of Athletics, Director of Admissions and most recently as the Vice President for Enrollment Services and Strategic Planning. A key part of Nancy's time at Judson was creating and launching the RISE program which is a fully inclusive college experience for students with intellectual disabilities. This program came to life after Nancy gave birth to a child with Down syndrome in the fall of 2015 and she was inspired to give differently abled students the same experience as the traditional students. Nancy lives in the Huntley area with her husband, Chad, and their three children, 7-year old boy-girl twins Camryn and Carson, and 3-year old Cody who has Down syndrome.